While the jury is still out on whether the Egyptian Mau in fact has roots in Egypt, we find this frisky feline GUILTY. Guilty of being the spitting image of the statues that decorate the palaces and temples of ancient Egypt. They broke into the European cat scene sometime in the 1950s, impressing with their supermodel poise, before exploding in America like the copy-cat Beatles soon would. These medium-sized felines get the bragging rights for being one of only two naturally-spotted domestic cat breeds, the other being the Bengal. Coupled with their trademark gooseberry-green eyes, it’s as close as you would want to get to having a wildcat perched on your couch. A dead giveaway of an Egyptian Mau is the unique markings it sports on its forehead - a ringer for the sacred scarab beetle. Their fine, silky coat is usually silver, bronze or smoke-hued; less common coat colours include solid black and smoky blue. A fierce friend to the ones they pick as their special person, they take time to warm up to new faces. Once they see a familiar face though, Egyptian Maus love human company, especially that of playful children - but what they really look forward to is new toys to wrestle with. Remember that these cats are built for agility and lightning speed: they are the fastest domestic cats, after all. They get along great with most other pets but if you have birds at home you might want to put some distance between the chirpers and this particular kitty. They like to get extra playful with feathered friends! A dense short coat means little shedding and, in even better news, their bathing needs are bare-minimum too. However, these hyper little furballs need regular exercise to keep them from ricocheting off your walls. Installing a scratching post means your Egyptian Mau gets to stretch out all her muscles and get timely manicures. Plus, your mahogany coffee table lives to fight another day: with the right accessories, everybody wins. Should you pick a short hair kitty or a real fluff ball? Should you get the hyperactive ones or kitties that appreciate quiet time? Well, don’t flip a coin to decide! 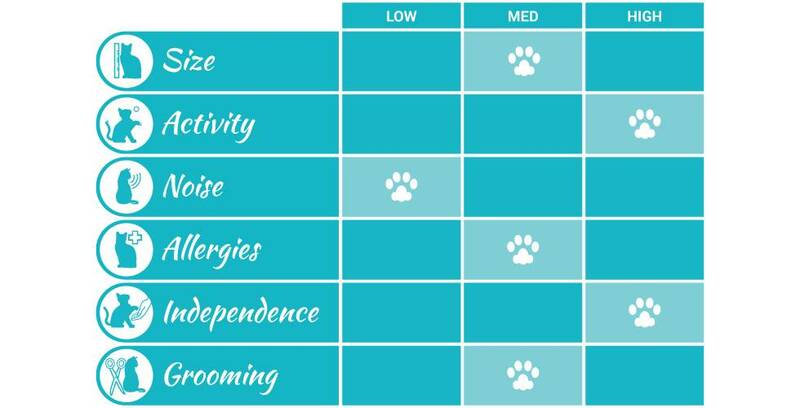 Chance is a fickle thing, and our Ultimate Guide to Cat Breeds is just a click away.